This volume is a slightly rushed attempt at collecting the findings about the lynching, hate crimes and rise of cow vigilantes that have stormed the news in India over the last few years. It details the violence that has surged against Muslims, Dalits and other lower castes. While doing so, many writers take pains to establish the even more vulnerable position of women, children and the aged belonging to these backgrounds and families. 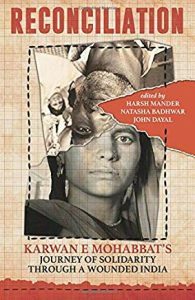 The book is a result of the Karwan E Mohabbat (‘Caravan of Love’) journeys that human rights activist and social worker Harsh Mander and others initiated last year to help lend an ear to the victims of hate violence. Many elements combine to make this volume a searing indictment on the Indian state and the idea of India itself. As an organized response to the state apathy and indifference, Harsh Mander and others gather to cover those regions, cases and families worst affected by the lynching and riots. These journeys are crowd funded. In many of them, Mander and others find hostility from the Hindu majority. At one location, in Mewat in Haryana, their bus is stoned. At the site of Pehlu Khan’s burial, Mander aims to place marigolds and is barred by the local police to do so initially and is finally allowed after much struggle. Through most of the journeys, the travellers find similar patterns: trumped up charges over beef and cattle thievery; police disengagement from investigation and often filing ‘cross cases’ against the victims of cases who have aimed to file First Information Reports; a criminal extortion economy. India does not come across as a democracy at all in these pages; indeed, it comes across as the opposite. This is an angry, upsetting book. And that is why it requires to be read. The first part of the book records the experiences of the areas worst hit by hate violence and hate crimes. These include areas like Nellie in Assam, rural Odisha, Tilak Vihar in Delhi–signposts of sectarian and caste conflict in contemporary Indian history. It is the express intention of the editors of the book to place the context of the recent violence in a broader framework of bloodletting in a so-called secular democracy. Viewed from the perspective of the weakest and poorest, Indian democracy appears a travesty. The third part of the book collates the experience of the individual travellers. Journalist-activist John Dayal writes about his experiences covering anti-Christian Adivasi violence in Odisha and Telangana. His chapter sheds light on the police-vigilante nexus that is at the heart of the majoritarian closing of ranks in India. Here, the Indian state comes across as anti-people and the embodiment of the Public Enemy Number One. But by the time one gets to Dayal’s essay the reader would have been horrified by the terrible details of the violence. Journalists like Priya Ramani and academics like Sanjukta Basu talk about their time being part of the Karwan and coming into contact with the families of the victims. There is much exploration on suffering and healing and its attendant helplessness. Some of the participants point to the gendered experience of the victims. In many cases, men are at the forefront of the aman sabhas (peace meetings), while women remain in the background. At one point, a female sarpanch of a village urges the menfolk to pull the women into the activities. The most powerful essay in the book, all of four pages, is by Nidhi Suresh, a 22-year-old journalist who is unable to get the complex context of the journeys fully and chooses to be the ‘wallflower’ of the Karwan. There is a moment she describes about identifying a woman, a victim’s kin, who sees her and she knows her life will change for she will be told something she will have no response to and no words for as reply. Suresh’s personalization of that moment makes for stirring reading, where the lines between reporter and the subject are blurred and sympathies switched. Her essay is also the clearest piece of dissent about the Karwan in the book. She questions whether the Karwan intervenes in the healing process of the victims by being invasive: Shouldn’t the victims need more active listening to from Karwan members? Suresh questions her own and the Karwan’s gaze, while shedding a tear or two. Many pieces tend to repeat information already mentioned earlier in the book. Often, Mander appears to get attention over and over again. Still, the depth of the book tides over these concerns. An essay by academic Prabhir Vishnu Poruthiyil from the Indian Institute of Technology, Tiruchirapally, powerfully and validly compares the silence of corporate India over the violence vis-à-vis the stridency of corporate America over Donald Trump’s shenanigans and malfeasance. Mander ends the book with some hope detailing the tragedies and humanitarianism of Maulana Imdadullah Rashidi, the imam of Asansol in West Bengal who lost his son in sectarian rioting and the Saxenas of Delhi whose son was murdered for being in love with a Muslim girl. The father of the murdered Delhi man, Yashpal Saxena refuses to ‘communalize’ the matter of his son’s death. These are some of the silver linings in a book that is grey with grief and red with blood. Is it the death-knell of the illusions we have about India: arguably the greatest human tragedy mankind has ever known? Rahul Jayaram teaches at the Jindal School of Liberal Arts & Humanities, Sonipat, Haryana.